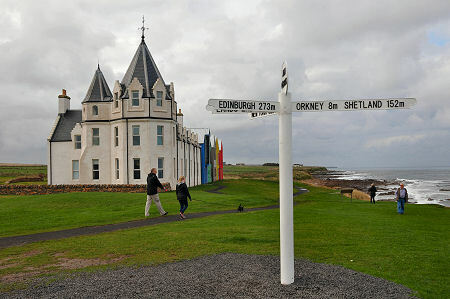 The sign you'll usually find above the harbour at John o' Groats says it's 874 miles from, or to, Land's End. And while Dunnet Head ten miles to the west, extends further north, and Duncansby Head, to the east, is probably a mile or two more distant from Land's End, John o' Groats is the place you start or finish if you want to cover the length of Britain playing hopscotch or pushing a pea with your nose. As a result it's attracted quite a following over the years. Most of the guidebooks are unflattering about John o' Groats. It's always tended to be a place that leaves you wondering what visitors who travel the length of Scotland to reach it actually think when they arrive. Various editions of our own feature have presented a mixed picture. After one visit we were pretty upbeat, reporting the addition of a new craft/workshop village beside the enlarged car park. After our next visit we reported that the new additions were not thriving as we had hoped. Our most recent visit followed the completion of a £2m redevelopment of the John o' Groats Hotel which turned it into self catering accommodation and included a development of self catering lodges on the land behind the hotel. The good news is that there seems to have been no reduction in the steady stream of visitors making their way to John o' Groats, and this in turn ought to ensure that in the long term it will be possible for it to become somewhere that more obviously repays the effort of getting here. An especially welcome arrival has been the Storehouse Restaurant, offering food and drink to the traveller, whether they have arrived from Lands End or from Wick. 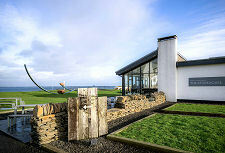 Visitors can explore a number of gift shops at John o' Groats and there is another coffee shop and a small museum. The Tourist Information Centre doubles up as a shop offering a very good selection of books of local interest. The craft village still provides accommodation for a candle maker, but most of the premises were vacant when we last visited. The camping and caravanning site remains highly active and offers superb views over the Pentland Firth. 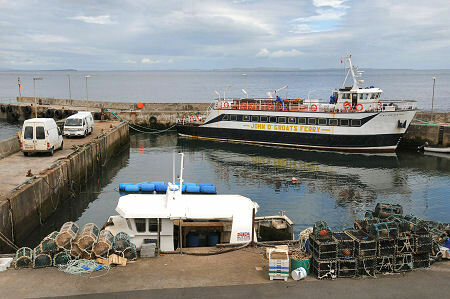 The attractive harbour at John o' Groats is home to the Pentland Venture, a ferry that carries foot passengers across the short distance to Orkney between May and September. Wildlife cruises are also on offer. The harbour area forms just one part of John o' Groats. A third of a mile south, the junction between the A99 from Wick and the A836 to Thurso provides a focus for another part of the settlement, and here you find a choice of accommodation on offer including the Seaview Hotel. Meanwhile, if you look just a little more widely, Duncansby Head, a little under two miles to the east, is well worth visiting. John o' Groats is named after a Dutchman, Jan de Groot. In 1496 King James IV granted De Groot the ferry franchise between the harbour here and Orkney, which was at the time still a relatively new acquisition by Scotland. It has been suggested that De Groot gave his name to the silver coin, the Groat, as this was the level at which his fares were fixed by the authorities to curb his efforts to cash in on his franchise. The truth is that groats as coins predate De Groot by the better part of two centuries. De Groot started the development of the area around the harbour, building a house, reputedly octagonal, and located not far from the hotel. Whether he chose this shape to provide better protection from the elements, or to ensure, as one story would have it, that every guest at his octagonal dining table could believe themselves to be sitting at its head, is debatable. Either way, it is interesting to see the shape reflected in parts of the design of the John o' Groats Hotel. 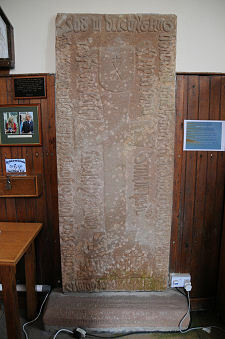 De Groot's gravestone, known as the John De Groat Stone, can be seen in the vestibule of Canisbay Kirk, two miles to the west.